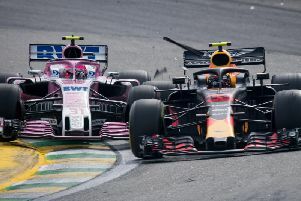 Ocon collided with then-race leader Verstappen's Red Bull car as he tried to come back from two laps down at Interlagos, pitching both cars into a spin, gifting the victory to Lewis Hamilton. After the race, Verstappen clashed with the Force India driver, shoving him while the pair waited to be weighed. The stewards called both drivers in following the altercation, and handed down the punishment to Verstappen, while Ocon's 10-second stop-and-go penalty during the race was as far as his punishment went. An FIA statement read: "Max Verstappen entered the FIA Weigh Bridge Garage, proceded directly to Esteban Ocon and following a few words, started an altercation, pushing or hitting Ocon forcefully several times in the chest.